It appears that all polls are consistently showing the poll numbers for Speaker of the House Nancy Pelosi are low and she remains a drag on the Democratic Party and the image of elected democrats. 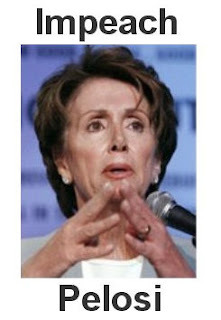 Friday's poll numbers released by Gallup revealed that Pelosi is viewed unfavorably by at least half of Americans. She had a favorability polling of only 34%. Earlier in the week other polling numbers reported similar results: the liberal CNN polling showed only a 39% approval rating for Pelosi performance. A poll conducted by Research 2000 for the liberal DailyKos revealed both House Speaker Nancy Pelosi and Senate Majority Leader Harry Reid each had a 30% favorability polling numbers. Gallop is reporting Pelosi's current image rating is more negative than positive by a 16 percentage point margin with 50% unfavorable. Pelosi's decline since last fall is seen equally in her ratings from Republicans and independents, with little change in the views of Democrats. The percentage of Republicans viewing her favorably fell 12 points, from 21% to 9%; the same drop in favorability was seen among independents, from 37% to 25%. Impeach Nancy Pelosi is not related to the above referenced polling sources. It is growing statement of opposition on FaceBook. We know it is not really possible to"impeach" Nancy Pelosi but she has Impeached herself. Within the last 38 days, 21,514 members have joined the new Impeach Nancy Pelosi fan page . Join Us for fun, conversation and a way to learn about actions you can take to help other face the fact that Pelosi should not be Speaker of the House. The page was created by Steven Foiley, The Minority Report and by Bill Smith (Ozark Guru), ARRA News Service. Tags: Gallup Poll, Impeach Nancy Pelosi, Impeachment, Nancy Pelosi To share or post to your site, click on "Post Link". Please mention / link to the ARRA News Service. Thanks! by Charles Krauthammer: Obama the Humble declares there will be no more "dictating" to other countries. We should "forge partnerships as opposed to simply dictating solutions," he told the G-20 summit. In Middle East negotiations, he told al-Arabiya, America will henceforth "start by listening, because all too often the United States starts by dictating." An admirable sentiment. It applies to everyone -- Iran, Russia, Cuba, Syria, even Venezuela. Except Israel. Israel is ordered to freeze all settlement activity. . . . What's the issue? No "natural growth" means strangling to death the thriving towns close to the 1949 armistice line, many of them suburbs of Jerusalem, that every negotiation over the past decade has envisioned Israel retaining. It means no increase in population. Which means no babies. Or if you have babies, no housing for them -- not even "within" the existing town boundaries. Which means for every child born, someone has to move out. No community can survive like that. The obvious objective is to undermine and destroy these towns -- even before negotiations. . . . 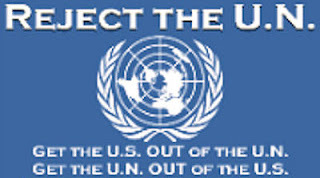 This idea is not only logical, not only accepted by both Democratic and Republican administrations for the last decade, but was agreed to in writing in the letters of understanding exchanged between Israel and the United States in 2004 -- and subsequently overwhelmingly endorsed by a concurrent resolution of Congress. Yet the Obama State Department has repeatedly refused to endorse these agreements or even say it will honor them. This from a president who piously insists that all parties to the conflict honor previous obligations. . . . Tags: Barack Obama, Charles Krauthammer, Israel, Obama administration, settlements To share or post to your site, click on "Post Link". Please mention / link to the ARRA News Service. Thanks! "Legitimate Right to Pursue Nuclear Energy"
The Washington Post: "Obama says Iran's energy concerns legitimate." Just a minute: Iran has all the resources it needs for energy production now. Why are they wasting their money in nuclear power? Oh yea, they need nuclear warheads to go with their missiles. So what about nuclear power for the US? Here we are dependent upon foreign oil on one hand, or still using what Obama claims is “dirty” coal power on the other, yet Obama still refuses to allow his own countrymen build new nuclear power plants. Oh, sure, he made noises about cautiously supporting nuclear power for the U.S. during the late presidential campaign, but his nuclear power denying actions since have spoken louder. Even during the campaign pro-Obama Newsweek concluded that Obama was anti-nuclear power for his own people. And since his election, it has become clear that he will not move forward on construction of any new American nuclear power plants. One of the biggest obstacles to American nuclear power plants concerns what to do with the waste. Of course, it appears that Obama has turned his back on the Yucca Mountain project, the one project that could have served as the nation’s nuclear waste dumping site. Without the Yucca Mountain dumpsite approved, expecting to build new nuclear plants is difficult at best. So, in essence, Obama has shut down any possibility of building new plants forcing the U.S. to remain a slave to foreign oil and “dirty” coal, two things he also claims he’s against. 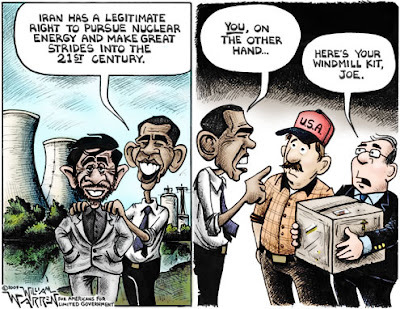 Tags: America, Barack Obama, clean energy, green energy, Iran, nuclear energy, political cartoon, William Warren, wind energy To share or post to your site, click on "Post Link". Please mention / link to the ARRA News Service. Thanks! Tags: bankruptcy, Chevrolet, General Motors, GM, Political Cartoons, William Warren To share or post to your site, click on "Post Link". Please mention / link to the ARRA News Service. Thanks! The Senate in recess until 2 pm; in the evening,they will vote on cloture on the Dodd substitute amendment to the FDA tobacco regulation bill, H.R. 1256. That makes at least five separate occasions where Sotomayor made remarks suggesting race and gender should affect a judge’s decisions. These are certainly things that Judge Sotomayor will be asked about during her hearings before the Judiciary Committee. In the meantime, the White House might want to revise its explanations of what they think she meant. Tags: FDA, Sonia Sotomayor, tobacco products, US Congress, US House, US Senate, Washington D.C. To share or post to your site, click on "Post Link". Please mention / link to the ARRA News Service. Thanks! The Senate will resume consideration of H.R. 1256, a bill to allow the FDA to regulate tobacco. Roll call votes are possible throughout the day. It appears today that President Obama is doubling down on his pledge to close the detention facility at Guantanamo Bay by next January, yet little has changed since the Senate voted 90-6 to deny funds for bringing detainees to the U.S. In fact, the only thing that appears to have changed is that opposition from the public to closing the facility has deepened. But, The Hill notes, “Democrats attending the meeting said the White House presentation was met with skepticism.” Little wonder that Democrats were skeptical given the overwhelming vote last month and a new Gallup poll showing that Americans oppose closing Guantanamo by 65%-32%. Further, 74% oppose closing the facility and moving some detainees into their states. 54% percent feel so strongly that they not only oppose closing Guantanamo, but would be “upset” if it is closed. In particular, self-described political independents are strongly opposed to closing the facility by 68%-29%. Tags: FDA, Gitmo, tobacco products, US Congress, US House, US Senate, Washington D.C. To share or post to your site, click on "Post Link". Please mention / link to the ARRA News Service. Thanks! Update: July 25, 2012: FoxNews: Man Sentenced to Life in Arkansas Military Recruiting Station Shooting. LITTLE ROCK, Ark. – A man who confessed to shooting two soldiers outside a military recruiting station in Arkansas struck a plea deal with prosecutors Monday to avoid the death penalty. Abdulhakim Muhammad pleaded guilty in the middle of his trial to capital murder and attempted capital murder charges. Pulaski County Judge Herbert Wright then sentenced Muhammad to life in prison without parole for capital murder, with 11 more life sentences for the remaining charges against him plus an additional 180 years in prison. But prosecutors had to withdraw the death penalty for Muhammad to plead guilty to capital murder. Arkansas law requires a defendant to be tried if lethal injection is a sentencing option. . . . Muhammad was charged with the killing of Army Pvt. William Andrew Long. He also was charged with attempted capital murder for wounding Pvt. Quinton Ezeagwula in 2009. Muhammad was born Carlos Bledsoe but changed his name after converting to Islam during college. In 2007, he traveled to Yemen, where Islamic extremists are known to seek sanctuary. He overstayed his visa and was deported back to the U.S. Muhammad claimed to have links to terror groups . . .
Update: Pvt. William Andrew Long laid to rest; remembered and mourned! However, politics have proved obstructive to all facets of counter terrorism policy. And politics may have been at play in the Muhammad case as well as in other cases involving Black Muslim converts. Several weeks ago, STRATFOR heard from sources that the FBI and other law enforcement organizations had been ordered to “back off” of counter terrorism investigations into the activities of Black Muslim converts. At this point, it is unclear to us if that guidance was given by the White House or the Department of Justice, or if it was promulgated by the agencies themselves, anticipating the wishes of President Barack Obama and Attorney General Eric Holder. Had the FBI opened a full-field investigation on Muhammad, and had it conducted surveillance on him, it would have been able to watch him participate in preoperational activities such as conducting surveillance of potential targets and obtaining weapons. There is certainly going to be an internal inquiry at the FBI and Department of Justice — and perhaps even in Congress — to determine where the points of failure were in this case. We will be watching with interest to see what really transpired. The details will be extremely interesting, especially coming at a time when the Obama administration appears to be following the Clinton-era policy of stressing the primacy of the FBI and the law enforcement aspect of counter terrorism policy at the expense of intelligence and other elements. The above points beg many questions: Why did President Barack Hussein Obama ignore Private William Long, Private Quinton Ezeagwula, the military recruiters, their friends and families, and the people of Arkansas? Why would the Obama administration order the FBI and other law enforcement organizations to “back off” of counter terrorism investigations into the activities of Black Muslim converts? Why did the Department of Homeland Security issue a document labeling conservatives, pro- constitution, Pro-bill of rights, veterans, as "right-wing" extremists and potential domestic terrorists? AP reports: President Barack Obama met with Saudi King Abdullah on Wednesday in Riyadh, where he stressed the need for the two countries to cooperate. "I am confident that working together that the United States and Saudi Arabia can make progress on a whole host of issues of mutual interest," said Obama. Pakistan was expected to be on the agenda when the two leaders met. . . . Obama's defense secretary, Robert Gates, has already asked the Saudis for help in staving off the spread of militants in Pakistan and encouraging Pakistani officials to work together in countering the terrorist threat. President Obama, today you may be speaking to 1.5 billion Muslims but the fact is that the majority of them will not hear you or will refuse to hear you because you have violated the "sacred laws" of Islam by converting from Islam to Christianity. Therefore, you are to them -worse than an infidel. President Obama, today the blood on the pavement outside of the Army Recruiting Station in Little Rock, Arkansas cries out for justice and for a president worthy to be called the Commander-in-Chief. You have dishonored a fallen soldier and elevated the enemies of our country. Your administration has ordered the FBI and other law enforcement organizations to “back off” of counter terrorism investigations into the activities of black* Muslim converts. You have catered to our enemy in an attempt at appeasement. Tags: Barack Hussein Obama, Barrack Obama, FBI, Little Rock, Middle East, Muslims, STRATFOR, veterans To share or post to your site, click on "Post Link". Please mention / link to the ARRA News Service. Thanks! Gary Bauer: Our president has set off on his pilgrimage to the Islamic world, and truth is already one of his first causalities. Yesterday, in an interview on a French television station, the president observed that the U.S. could be considered “one of the largest Muslim countries in the world.” Obama must be counting Muslims in our 57 states that he claimed to have visited during the campaign. Where the seven extra states are located is still a mystery. You will recall that on his last trip abroad the president denied we are a Christian nation, even though America was clearly built on Judeo-Christian values and concepts about human dignity and freedom, and our population is overwhelmingly Christian. Now he is trying to sell us abroad as a Muslim nation. The average American should be furious. But it doesn’t end there. Barack Hussein Obama wants it both ways. In his world view, America isn’t a Christian country but it is one of the largest Muslim countries in the world. He doesn’t want anyone to bring up his Muslim roots when they are talking to American voters, but his Muslim roots become the main selling point when he is headed to Cairo and Saudi Arabia. While You’re There, Mr. President… In a column today in Politico, I urge the president not to ignore the persecution of religious minorities in the Muslim world. I will be watching eagerly to see if he will defend the rights of his Christian brothers and sisters to practice freely the same faith he professes to share. A Larger Plot? Yesterday, officials investigating the murder of Private William Long were quick to suggest that converted Muslim extremist Abdulhakim Mujahid Muhammad acted alone. However, Fox News reported today that a senior U.S. official found multiple possible targets on Muhammad’s personal computer. Some of these include Jewish organizations, a Baptist church, child care centers, a post office, and other military recruiting centers in the southeastern United States, New York and Philadelphia. This information suggests that Muhammad may not have been acting alone and perhaps was part of a larger terrorist plot. Once again the liberal media bias has been put on display for the American people to see. Immediately following the murder of George Tiller on Sunday, news outlets around the country suggested the suspect had ties with pro-life organizations. Yet when an innocent American service member is gunned down outside of a recruiting center, the media think it would be irrational to accuse the suspect of having ties to terrorist groups. The double standard at work in the American media is disgusting. This episode is just one more example of how leftwing political correctness – specifically the media’s denial about the threat of Islamofascism – hurts our national security. We will keep you posted on any new developments in this case. By the way, President Obama has still not commented on this terrorist attack. See also: The Silence is deafening! Where is Commander-in-Chief Obama? Tags: Barack Hussein Obama, Barack Obama, Gary Bauer, media bias, Muslim, terrorist attack To share or post to your site, click on "Post Link". Please mention / link to the ARRA News Service. Thanks! Yesterday the Senate voted 84-11 to invoke cloture on the motion to proceed to H.R. 1256 and resumes consideration of the motion to proceed to H.R. 1256, a bill to allow the FDA to regulate tobacco. In our history, who would have every thought that tobacco could be regulated as a food or drug. Again, Federal intervention into the lives of America under the current Obama administration. The Journal also notes, “[President] Obama had 24 Senate Democrats over for a White House chat yesterday to drive the calendar ahead.” The White House even released a list of all the senators who came to talk health care, but, interestingly, not one Republican was on that list, even though Obama and Senate Democrats have declared their determination to have a bipartisan process on health care. Tags: Barack Obama, FDA, nationalized health care, tobacco, US Congress, US Senate, Washington D.C. To share or post to your site, click on "Post Link". Please mention / link to the ARRA News Service. Thanks! Tags: Little Rock, Arkansas, Rally, Secure Arkansas, support troops, terrorist attack, soldier killed, soldier wounded To share or post to your site, click on "Post Link". Please mention / link to the ARRA News Service. Thanks! Update: July 25, 2012: Visit this link for additional info and final sentencing in the shooting of two military soldiers / murder in Little Rock, Arkansas by Muslim convert. Update: Added comments by others at the end of this article. Others also have noticed the "silence" by BHO. Bill Smith, ARRA Editor: Yesterday, we heard the shocking news that a Muslim convert "with political and religious motives" shot two uniformed soldiers outside a Little Rock, Arkansas military recruiting center. Private William Long, 23, died, and Private Quinton Ezeagwula, 18, was wounded and is currently in stable condition. According to Lt. Col. Thomas F. Artis of the Oklahoma City Recruiting Battalion, the two soldiers had completed basic training within the past two weeks and were not "regular" recruiters. In the military terminology, the Army had allowed these two young men to return home after basic training for a designated period of time before reporting to their next military dusty assignment if they would work with recruiters and assist them in recruiting and talking to potential recruits. Gary Bauer, Campaign for Working Families (4:12 pm): Muhammad had been under investigation by the U.S. Federal Task Force on Terrorism. How did he get his weapons and commit these crimes when he was under investigation? The sound you heard after this terrorist attack was silence. President Obama, who immediately condemned the murder of abortionist George Tiller on Sunday, still has not – 24 hours later – said one word about the cowardly attack on these soldiers. The U.S. Justice Department, which sent federal marshals yesterday to guard abortion clinics, has sent no one to guard our military recruitment offices, even though more than 100 of those offices have been attacked in recent years. As for the president, he is the commander-in-chief. He is responsible for the wellbeing of our men and women in uniform. His silence in the face of this brutal attack is shameful. Michelle Malkin (12:47 pm - even before above post): Not a word about the jihadi attack on the two Army recruiters in Arkansas. No condemnation of the heinous attack and senseless violence. No condolences for the families of the targeted men or praise for the military recruiters who have been under increasing attack on U.S. soil. No statements from the DOJ or Pentagon, either. Nothing. Pam Meister (June 3rd): As of this writing, there has been no public statement about the Little Rock shooting from either President Obama or his representatives in the White House. I realize he’s on his way to the Middle East and is just as busy as he can be, but somehow he managed to find time to pledge U.S. support in helping to do whatever is necessary to find out what happened to the Air France plane that recently disappeared over the Atlantic as if flew from Rio de Janeiro to Paris. His administration also found the time to encourage American embassies around the world to invite Iranian officials to their July Fourth festivities. . . . Keith Olbermann once odiously compared right wingers to Jihadists. Here’s a real-life Jihadist, gunning down those who volunteered to serve our nation in cold blood. What will Keith say about him? Mark Taylor (June 3rd): Although these callous murders were clearly inspired at least in part by the very ideology with which we are at war, radical Islam, in a display of flabbergastingly bad judgment the Commander-in-Chief of these dead and wounded American soldiers, Barack Obama, has not spoken one word of either outrage or compassion for the event. Why do that and spoil all the fun he’ll have at his Cairo speech? . . . And as a state mourns the tragedy of Jihad in Central Arkansas, the root cause of the murderous act is ignored: a radical, hate-filled belief system that is creeping its way into our prisons and into the country’s mosques and communities. Yes, the unthinkable, Jihad, has come to Central Arkansas. When will it come to your town? Kenneth Wallis (June 3rd): A terrorist attack from Islamofacism that had not occurred since 9/11 under the Bush Administration has occurred under Obama. Despite this terrorist attack, no statement has been made from the leader of the United States of America, nor the Head of the Department that is supposed to prevent these attacks, nor Little Rock's United States Representative Vic Snyder. Tags: Arkansas, Barack Obama, Bill Smith, Commander-in-Chief, Eric Holder, injured troops, Islamic terrorist, Little Rock, military, Murder, Muslim, Robert Gates To share or post to your site, click on "Post Link". Please mention / link to the ARRA News Service. Thanks! Americans for Prosperity’s Hot Air Balloon Tour to Stop in Arkansas to Expose Hidden Energy Tax Hike in “Cap-and-Trade” Legislation, June 3rd in Little Rock and June 4th in Fayetteville [Event Locations Below] Free rides in AFP’s 70 foot hot air balloon will be provided to the public! AFP’s Hot Air Tour has the goal of building grassroots pressure against costly state, local, and federal climate change policies. AFP has pledged to mobilize citizens in order to fight off any attempts to pass a cap-and-trade regulatory scheme. Attendees will have the chance to ride in AFP’s hot air balloon and listen to Americans for Prosperity President Tim Phillips speak on the economic dangers of cap-and-trade legislation. The event is free and open to the public. Food will be served. For more info about the Hot Air Tour, including a full schedule of events, please visit www.hotairtour.org. Americans for Prosperity (AFP) is a nationwide organization of citizens committed to advancing every individual’s right to economic freedom and opportunity. AFP believes reducing the size and scope of government is the best safeguard to ensuring individual productivity and prosperity for all Americans. AFP educates and engages citizens in support of restraining state and federal government growth and returning government to its constitutional limits. Tags: AFP, Americans for Prosperity, Arkansas, Ballon, cap-and-trade, carbon tax, Fayetteville, Hot Air Balloon Tour, HotAir, Little Rock To share or post to your site, click on "Post Link". Please mention / link to the ARRA News Service. Thanks!